"Theatre belongs to the people and is for the people." Since 1979, the Stephenville Theatre Festival has produced professional plays of the highest quality here in Newfoundland. Due to a provincial drama festival held here in Stephenville, the festival was started. The adjudicator of this drama festival, Maxim Mazumdar, was impressed with the caliber of performers from around the province; yet the performers wanted more - more training, more experience, and more interaction- with other artists. A group of volunteers predicted that tourism could enhance summers in Stephenville and urged Maxim to come back. Maxim did come back, to establish the Provincial Drama Academy in 1978/79, as a place to learn about the theatre, to work with professionals, and practice one's craft. From this came the Stephenville Theatre Festival, which developed into one of Atlantic Canada's most promising, exciting, and eclectic producers of theatre. The ability to make magic happen on stage with little money has become what Stephenville Festival is known for. 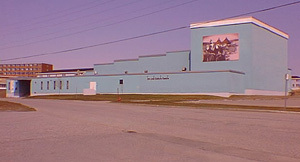 The experience of Shakespeare, Broadway, twentieth century classics, new Canadian works, all kinds of music, and unique Newfoundland creations are all found here. New anti-war plays, country musicals, and huge extravaganzas were there for everybody. They may have been attracted to the Festival by something familiar - but they came back time and again to try something new. This year (1998) will be the first year for "Friendly Invasion", based on the book of the same title by John Cardoulis. This play is based on Stephenville's intriguing history as the site of the Ernest Harmon Air Force Base. It is a tribute to the unique relationship between Newfoundland and the American military. It is hoped that "Friendly Invasion" will become an annual addition to the range of productions for which the Festival became famous for. Of course, there are practical benefits of the Stephenville Festival, which were always evident and impressive. The Festival creates anywhere from forty-five summer jobs in a small year to as many as eighty in other years. Sometimes, almost twenty to forty percent of the audience is from of the island. Stephenville Festival attracts people that wouldn't normally stop here. Many individual local businesses sponsor specific performances or make donations. The annual budget of the Festival (of about two hundred and fifty thousand dollars to three hundred thousand dollars) has a positive impact on many businesses and merchants. The festival has played one of the main parts in developing a thriving summer economy, based on tourism. Stephenville Festival has been integral in the development and growth of such things as bus tours, hotels, bed and breakfasts, restaurants, campgrounds, and airlines, to name a few. Touring businesses are developing around this area today thanks to the Festival's uncanny ability to attract people. Stephenville Festival makes its home at the Arts & Culture Centre. There has yet to be any other group or individual able to give such life and enthusiasm to the building. In 1997, a new 'second stage' was opened; a beautiful yet simple two hundred seat black box. The Festival has made the Centre a viable, productive place. Many artists began their training with the Festival and have gone on to well-paying jobs locally and abroad. The Festival has also been instrumental in creating a number of new works. The careers of many of Newfoundland's finest performers was nurtured through the Festival. The Stephenville Festival has developed a very extensive list of travel agencies, tour operators, businesses, foundations, individuals, theatre companies, and government and related agencies. They have developed a very impressive corporate and private sponsorship program, supporting a considerable number of its activities. From all over the country, major corporations continually give financial support to the Festival, which imports new money for Newfoundland, and develops visibility and new markets for their products due to promotion and advertising by the Festival. The Festival has been recognized for its outstanding work. Our province presented Stephenville Festival with the Doug Wheeler award; it received a major award from Saga Communications; a special award was given as a Great Canadian Event from the Federal Canada 125 program for its work; and the Festival was named one of the top attractions by the North American Bus Association.